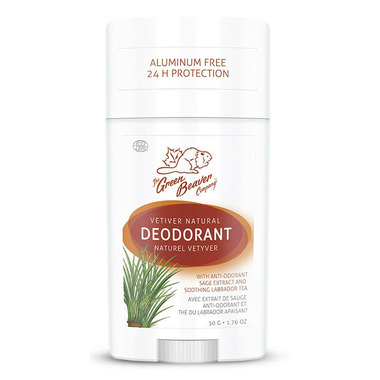 New and improved Green Beaver Co. deodorant contain a revolutionary organic sage oil isolate which is effective at killing existing odour, as well as preventing body odour. Contains soothing Labrador Tea which combats irritation caused by shaving. Plus this natural deodorant stick goes on clear and offers 24 protection from odours. Sorry to see this is discontinued. I purchased for my husband and he really likes it. It smells really nice with his body chemistry too. I bought this deodorant for my husband and he loves it. It has a nice woody masculine smell. It also works good. Works great! But my boyfriend doesn't like the smell. It is a good product BUT don't expect full protection against sweating. My husband uses it on his days off when he's not doing much. For hot summer days (he works outside) he has to have another stronger one. This deodorant works well but does not last the whole day. The scent is nice but is definitely more masculine. The stick does not leave marks or damage on my clothing. I will buy this line of deodorant again but will choose a different scent. Like this. It does the job and the scent is natural. Cannot go wrong with green beaver products. Does not last as long as regular deodorants but i will never go back. Feel safe using it. Does not stain clothes and not sticky. It's a truly natural deodorant, with essential oils in it. It just simply won't work for some people. yes, it goes on feeling a little wet and certainly doesn't keep your armpits dry. But if you like the earthy smell of vetiver, it works as well as most natural deodorants. Green Beaver products work exceptionally well considering they are baking soda free which many people like myself cannot tolerate. I rotate between vetiver, citrus and lavender green beaver deodorant. Vetiver is unisex as its pungent so not every woman will appreciate it. Very earthy and effective. Have purchased many times. Works ok...not the best natural deodorant I have ever used - leaves white residue (sticky / wet feeling) I usually have to rub it in, and I don't care for the smell. I LOVE Green Beaver so this was disappointing. Works magnificently. Low neutral odour. Expensive, so apply sparingly. I love the smell! If you like incense and patchouli this scent if for you. It was very strong at first but I got used to it quickly. I find any deodorant used for too long starts to be ineffective so I switch between this and Green Beaver's Lavender. Love their products! Not a fan of this scent, does leave a bit of white residue. Would not buy again. Scent is quite masculine, but the deodorant itself works just as well as any other scents I've tried. The scent is on the masculine side. Did not help to completely eliminate body odor during mild sweating. I could smell the Vetiver plus my BO after sweating. This was not the case with the Lavender version of Green Beaver Deodorant. With the Lavender one I used it during heavy sweat and it didn't produce any scent, including Lavender or my BO. Like the Lavender version, the Vetiver one did not cause any skin reaction or itchiness. The product is not sticky after application (same as Lavender one).